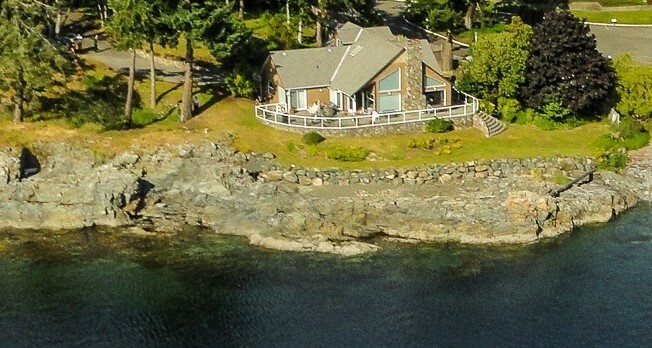 Rare opportunity to own a private, south-facing one-acre oceanfront estate with 300 ft walk-on beach in a protected cove in North West Bay, Nanoose on Vancouver Island. The one-level rancher home offers 3 bedrooms and den, 3 bathroom huge windows that bring sunlight inside while providing stunning ocean views; includes guest suite above garage. Living room features ship plank oak floors, 20ft vaulted ceilings and wood burning fireplace. Huge wraparound deck offers breathtaking views. Enjoy a lifestyle of water sports and bonfires on your private beach. Includes assured moorage for up to 45ft yacht at marina next door. Nanoose is a beautiful oceanfront enclave 25km north of Nanaimo. Call/text Annette (604) 369-6923.